I'm a little under the weather, and so I haven't been sleeping so well for the past couple of nights. In the half sleep-half awake state, I think of random things. One night I just felt an aching need to google the Tina Fey/Taylor Swift feud. But, you already know all about that, I'm assuming. And, that's not what I'm talking about today. So, in the middle of the night, I had what I thought was an amazing, magical idea. In my sleep-deprived daytime brain, this still seemed like an excellent idea. But then I made it. You know...I'm not a filmmaker. But, I still think it's kind of fun. It's like I magically can put this piece of paper back together and write backwards! Thanks, sleep brain! Now, in case you still don't know what I'm talking about, and you need to see something magical this morning, here it is! Enjoy! 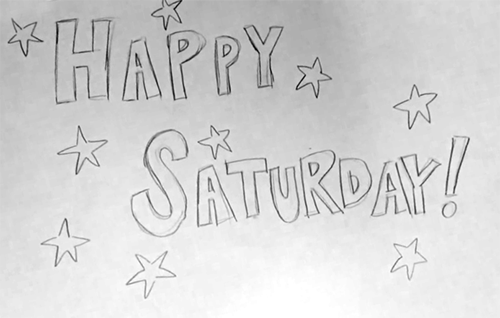 And, of course, have a happy Saturday!